Emma Hart is the sixth winner of the Max Mara Art Prize for Women, which nurtures new work by female artists based in the UK following an Italian residency. 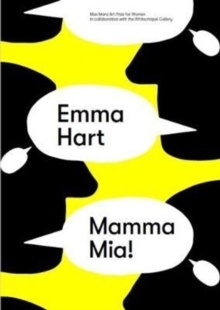 This book accompanies Mamma Mia! (2017), a charged installation of ceramic lamps resembling heads and upturned jugs which project speech bubble shapes upon the floor. The intricate patterns which form part of the work were designed by Hart following her experience with family psychotherapists in Milan, and refer to repeated patterns of human behaviour and their effect on relationships. The catalogue includes texts by Craig Burnett, Daniel F.
Herrmann and Marinella Paderni contextualising this major new work; an interview with guest curator Bina von Stauffenberg exploring the impact of Hart's Italian residency on her work; and full colour installation shots, family photos and striking graphics which bring Hart's ideas to life with characteristic vibrancy.